It's not about how our politicians look or dress but about what they say and the way they act. This has never been more true than it has been in the past few days. There is a stark difference between our President and her very powerful words delivered at the Republic Day investiture ceremony when compared with the behaviour of some politicians over the weekend. Minister Chris Cardona with his debauchery Dubai trip and his reply to the audit report, or even Minister Edward Zammit Lewis and his email faux pas are just a few examples. The President has come under fire many times because of the choice of her attire, especially during the CHOGM ceremonies just last year. It is important our head of state looks presentable in front of other dignitaries but the level of criticism levelled towards President Marie Louise Coleiro Preca back then verged on the hurtful and even though she is a public figure and hence is up to public scrutiny, she still is a human being and a very decent one at that too. I remember feeling sad seeing all the meme's going round comparing her to a ‘figolla' or a Christmas tree, all the people calling her incompetent because she went out the wrong side of the car or commenting on how she doesn't know how to present herself. All I could think of was "big deal." The President wore an unflattering outfit, so what? It is deplorable to think we can have a free for all and go on to hurt someone's feelings because of the way they look. It’s exactly what is so wrong with our country. We care so much about the image that we forget that what is really important is the substance underneath. It's true that this is not just a Maltese problem and that even elections are won or lost on image. Whilst good image and branding attracts attention and helps to pass the message across, I strongly believe that we can only mature and move forward as a nation if we go beyond the superficial and start to dig deeper and pay attention to what really matters. If we want to critique the President I would rather comment on the way the Presidency has been reduced to running the Community Chest Fund to continuously organise events for charity. This contrasts strongly with the statesman role taken by previous incumbents who acted as the nation's moral compass. The President showed how a true stateswoman should act. Well, that was before! Because yesterday the President showed how a true stateswoman should act. 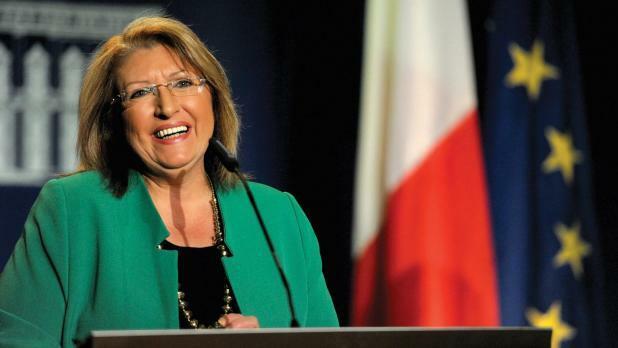 She spoke eloquently about every single issue that Malta is currently facing. She had strong words to say about the deportation of migrants who have been contributing to our economy for the last decade. She had harsh words about the over-development and lack of open spaces which is decreasing our quality of life. She called for an increase in minimum wage and asked us to think twice before using social platforms to spread hate. She spoke against the rise of racism and xenophobia we have witnessed recently and against the exploitation of workers. A truly remarkable speech and I simply cannot do it any justice by listing the issues tackled but you can read more about it here. Commenting on her dress sense isn't constructive, it's superficial and of no consequence. What's the point of having an impeccably dressed "woman of power" if what comes out of her mouth is going to take us back 15 years? So congratulations to our President for sticking to her socialist roots, for delivering a speech which will be talked about for months to come and for being the moral compass our little nation so desperately needs in these troubling times. Thank you Madame President.